The Technical Confluences Indicator shows that the battle lines are well-defined toward the all-important release of the US Non-Farm Payrolls. A congestion of support lines awaits around $1.1950 with the one-day High, the Bolinger Band one-day Lower, and the Pivot Point one-day Support 1. 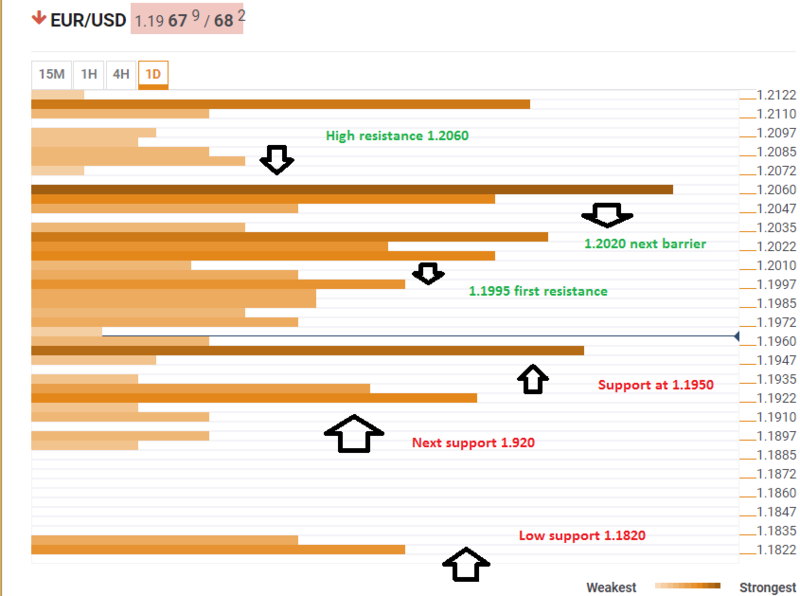 Further support is at $1.1920 which sees the confluence of the Pivot Point one-day S2 and the Pivot Point one-week S2. A break below this level opens the door all the way to $1.1820 which is the one-month S2. Looking up, the pair faces massive resistance with the first notable confluence around $1.1995 which is the meeting point of the Fibonacci 23.6% one-day, the 4h high, the Bolinger Band 1h-middle and the BB 15m-Upper. $1.2020 is the clustering of the Pivot Point one-week S1 and the Simple Moving Average-5 one-day. Even higher, $1.2060 is the confluence of the one-month low and the one-week low.